각연사는 칠보산 남쪽 기슭에 위치하고 있다. 사찰로부터 동남쪽 약 1km 지점에 통일대사탑비가 있고, 이로부터 동남쪽에 있는 보개산 주봉을 향해 약 30분 정도 올라가면 중봉의 능선상에 탑이 건립되어 있다. 탑은 본래 무너져 있던 것이 1965년 발견되었고, 흩어진 부재를 모으고, 찾아내어 1982년 6월에서 7월 12일에 걸쳐 괴산군에 의해 복원되어 현재에 이르고 있다. 탑은 기단부·탑신부·상륜부를 구비한 전형적인 팔각원당형 석조탑으로 전체 높이는 2.3m이다. 기단부는 지대석·하대석·중대석·상대석으로 구성되었는데, 전체 부재는 완전하다. 지대석과 하대 하단석은 1석으로 조성되었다. 지대석에는 아무런 조식이 없고, 하단석의 측면에는 좌·우각 4괄호형인 안상을 1구씩 배치했다. 하대 상단석과 중대석 받침 역시 1석으로 조성되었다. 상단석에는 복엽16판의 복연이 조식되었는데, 8각의 각 면과 모서리에 각각 1구씩 배치하였다. 판단에는 귀꽃이 조식되었던 것으로 보이는데, 모두 파손되어 흔적만 남기고 있다. 상면에는 각형 1단의 받침 위에 굽형괴임대를 받침으로 삼아 중대석을 놓았다. 중대석은 1석으로 조성되었는데, 각 모서리에 우주만을 모각하였다. 상대석 역시 1석으로 조성되었는데, 하면에는 각형 3단의 받침을, 측면에는 단판 복엽 16판의 앙연을 배치했다. 연화문은 8면의 중앙과 모서리에 각각 8판씩 배치하여 하대 상단석과 같은 양식을 보이고 있다. 상면에는 낮은 각형 1단의 받침을 조출해 탑신부를 받고 있다. 탑신부는 탑신과 옥개석을 각각 1석으로 조성했다. 탑신석의 각 모서리에는 우주를 모각했고, 전·후면에는 이중의 선으로 장방형 액을 마련하고 내부에 문양을 새긴 문비형을 모각했다. 옥개석의 하면에는 각형 3단의 받침을 조출하고, 처마의 하면에는 각 모서리에 1판씩 나머지 면에 3판씩 모두 복엽 32판의 앙연을 조식했다. 낙수면의 경사가 급하고 처마는 두껍게 조성되었는데, 기왓골은 두툼하게 묘사되었다. 전각에는 귀꽃을 배치했는데, 현재 4개소는 결실되었고, 나머지 4면에는 접착제로 부착했다. 정상에는 단엽 16판의 연화문이 조식된 복련대(伏蓮帶)가 마련되었다. 상륜부는 모두 결실되어 노반만 남아있는데, 옥개석과 1석으로 조성되었다. 측면에는 단엽 16판의 앙연이 입상형(立狀形)으로 조식되었고 정상에는 찰주공이 남아있다. 각연사 통일대사탑은 각부의 조각 수법이 우수할 뿐만 아니라 무너져 있던 것을 복원했음에도 불구하고 각 부를 구성하는 부재 또한 완전하다. 뿐만 아니라 통일신라시대에 확립된 팔각원당형 석조탑의 양식을 충실히 계승하고 있으며 양식적으로도 고려 전기 석조탑의 수법을 보여주고 있다. 특히 통일대사탑비가 858년-960년(고려 광종9년8월 -11년3월) 사이에 건립되었고, 이 탑의 주인공이 통일대사임이 입증된 점으로 보아 탑비와 같은 시기에 건립된 것으로 추정된다. 현존하는 절대 다수의 석조탑는 사찰의 한쪽 한적한 곳에 자리하고 있고, 탑비 역시 인근에 위치하는 것이 통식이다. 그런데 이 탑은 탑비와 멀리 떨어진 산 중턱에 건립되어 있어 위치상의 색다른 면을 보이고 있다. 더욱이 탑이 있는 곳에서는 사찰로 들어오는 진입로뿐만 아니라 각연사까지 조망되고 있어 다른 탑과는 확연히 다른 입지(立地)를 택하고 있다. 이같이 탑의 위치를 탑비와 멀리 떨어진 산 중턱에 건립한 예는 쌍계사 승탑, 보현사 낭원대사탑, 봉암사 정진대사탑 등 소수의 예에서만 볼 수 있다. 따라서 주변 및 사찰을 조망하기에 좋은 지점에 탑을 건립함은 9세기이래 산천비보사상에 의해 산 정상부에 석탑을 건립하는 것과 같은 사상적 배경을 지닌 것으로 생각된다. Gagyeonsa is a Buddhist temple located on a southern slope of Chilbosan Mountain. The Stele for Buddhist Monk Tongil (Treasure No. 1295) is located at about 1km southeast of the temple, and the Stupa of Buddhist Monk Tongil, located at about 30 minutes’ distance from here, on foot, toward the main peak of Bogaesan Mountain, stands on a ridge of the middle peak. The stupa was found in several pieces, when it was discovered in 1965, and was restored to the current appearance by Goesan-gun County, between June and July 1982, by rejoining the parts scattered across the site. The stupa is a typical stone stupa mounted on an octagonal pedestal, composed of a base, main section and a finial, and it stands 2.3m tall. The base section consists of four tiers of stone platforms. The stupa is complete with no missing elements. The bottom tier and the stone support for the tier immediately above are made from a single stone block. Whilst the bottom tier is plain, the second from the bottom tier has parenthesis-like eye motifs sculpted on both ends of its left and right sides. The top stone of the second from the bottom tier and the support for the third from the bottom tier are also made in a single stone block. The top base stone is carved with lotus flowers with two rows of sixteen petals, placed on the each of its eight facets. Corner floral designs added to the tips of the lotus petals have been mostly broken off, leaving only faint traces. 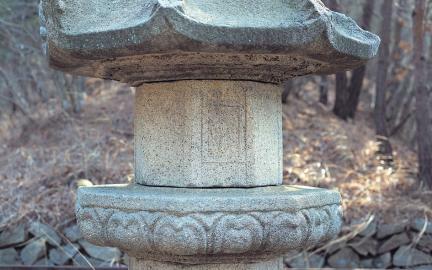 The middle stone is mounted on a stone support with a foot-shaped wedge placed above it. Of the side stone slabs surrounding the middle stone, only those in the four corners have column-like sculpted details. 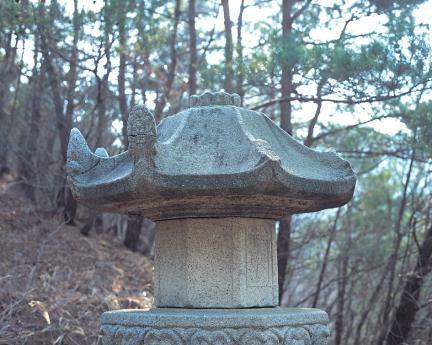 The top tier is made in a single stone block, and the three-tier polygonal support is decorated on the lateral side with sixteen upward-facing lotus petals with two rows of petals. The lotus petal motifs are present only on those of the eight facets that are in the center and in the corners, in that similar to the top stone of the second from the bottom tier. The top surface of the top tier was carved to create a low-rising platform upon which the main section of the stupa is placed. The body and roof of the main section of the stupa are each made with a single stone block. All four corner edges of the body of the stupa have column-shaped vertical sculpted details. On the front and back sides, sculpted designs are placed inside a rectangular frame created by incised lines, giving them the appearance of a memorial stone. The area immediately below the roof stone is carved to create three levels, and thirty-two upward-turned lotus petals in two rows of petals are added below the eaves of the roof stone, one at each corner and three in the rest of areas. The roof slopes are steeply pitched, and the eaves are thick. The roof tiles are rendered thick with blunt edges. A floral ornament is added at the end of each roof ridge, but four of them are missing, and the other four have been broken off and glued back. The summit of the roof is adorned with a band of sixteen down-facing lotus petals with a single row of petals. 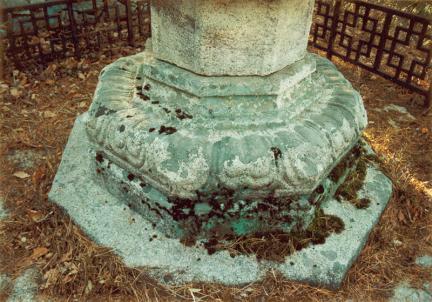 The finial is missing with only the base still remaining. 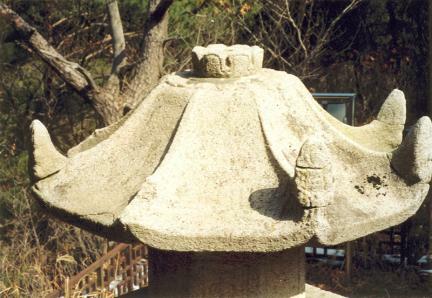 The finial base is made in the same block of stone as the roof. 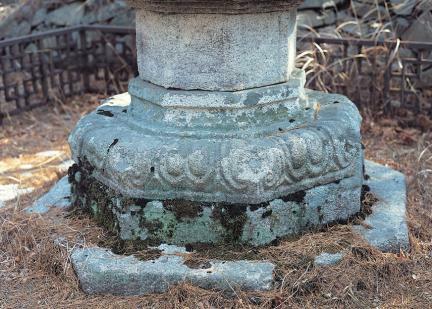 The lateral side of the finial base has sixteen sculpted upward-facing lotus petals with a single row of petals, and there is a hole in the middle, at the top, into which the finial was inserted. The Stupa of Buddhist Monk Tongil at Gagyeonsa Temple is an outstanding piece of sculptural work and is complete, even though it was found dismantled and disassembled, with all major pieces preserved intact. 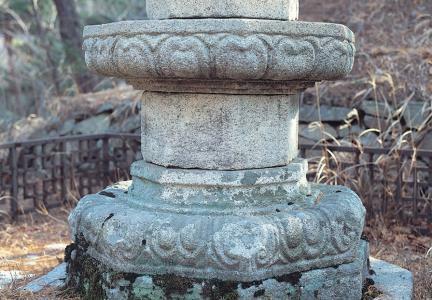 This stupa, faithfully following the octagonal stupa style perfected during the Unified Silla period, shows affinities to early Goryeo stone stupa. Meanwhile, given the fact that the Stele for Buddhist Monk Tongil was erected sometime between 858 and 960 (between the eighth lunar month of the 9th year of King Gwangjong’s reign and the third lunar month of the 11th year of the same reign during the Goryeo Dynasty), and that there is firm evidence that this stupa is dedicated to the monk Tongil, the stupa appears to have been made around the same time as the stele. Most surviving stone stupas are situated at a less visible corner of temple precincts with their associated stele also located near them. This stupa, meanwhile, is located on a mountain flank at some distance from the temple, and quite far away from the associated stele. 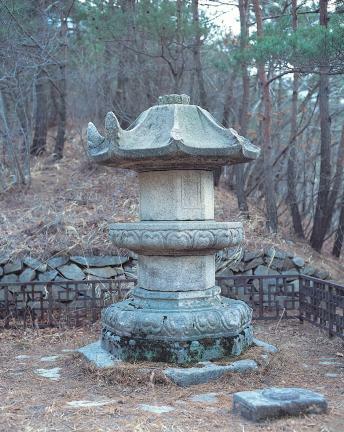 The location of the stupa is along the access road to Gagyeonsa Temple, providing a good view of the temple. There are a handful of cases in which a monk’s stupa is separated from the stele dedicated to him by a great distance. 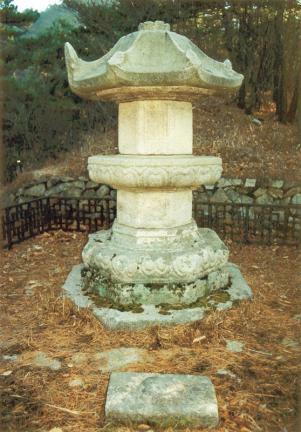 The Stupa at Ssanggyesa Temple, the Stupa of Buddhist Monk Nangwon at Bohyeonsa Temple and the Stupa of Buddhist Monk Jeongjin at Bongamsa Temple are the only three known examples. Placing a monk’s stupa at a location offering a good view of the surrounding environment or the Buddhist temple appears to be a philosophically-informed decision, much like the practice of erecting a stone stupa at the summit of a mountain, seen during the 9th century and thereafter, based on the idea that stupas can provide a beneficial energy to the surrounding natural environment.